In this Instagram pic from October 2012, Wolfgang Gartner shows off his tour bus producing setup. The studio monitors can be identified as KRK ROKIT 8s. He captions this photo, "tourbus mini studio." This photo of Steve Aoki in his villa in Ibiza shows him in front of what looks like a practice DJ setup, with a TV for the visuals, Pioneer gear, Serato running on his laptop, and KRK monitors. The monitors' size and placement of the KRK logo indicates they are the 3rd generation KRK Rokit 8 model. This photo is a screenshot from Aoki's documentary, ["I'll Sleep When I'm Dead"](https://www.netflix.com/title/80118930). in this picture we can se behind Dimitri the KRK Rokit RP8 G3 studio monitor used by him in the guerrilla studio. I use them for DJing in my second studio. More suitable for listening than monitoring. In the Instagram video, M4SONIC is using two KRK Rokit 8 studio monitors. Aero Chord's KRK ROKIT 8 studio monitors can be seen in this video clip he posts captioned, "New genre alert"
In this photo of Zeds Dead's studio, their pair of KRK Rokit 8 monitors can be seen. In this video DJ BL3ND is working using near field KRK Rokit 8 G3 at around 0:38. They are in the background of the A Day In The Life Of Ty Dolla $ign (R&R) video at 23 seconds in. 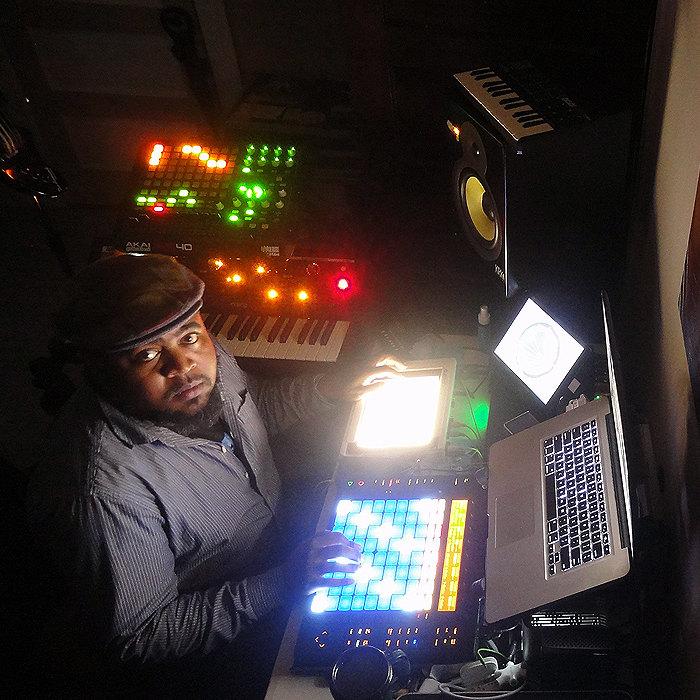 In this image of Cashmere's home studio we can see two KRK ROKIT 8 G3 Studio Monitors. At 6:36, if you pay close attention, the number "8" is spotted below the Rokit word to the right of the left-placed KRK studio monitor. Repow e suas KRK's no vídeo promo de dois ingressos pro EDC - Brasil. Bare can be seen with the KRK ROKIT 8 Studio Monitor at 0:46 into his studio tour with Scion AV. Bare states - "These two I've had forever, the KRK Rokit 8s. They are actual good..they give you good bass presence without making it too false". :15 seconds into this clip you can see Jonwayne has Rokits. I think they're the G3s. In this Instagram photo we can see krk rokit 8's on speaker stands in Jai Wolf's studio. You can see the typical yellow color of KRK products and if you look closely at the left speaker you can see that the model number is something like 8. I concluded that the exact model is KRK ROKIT 8 G3 but I can be wrong. We can catch a glimpse of a pair of KRK Rokit 8's in this video (recorded in Chief Keef's home studio). "Starting to come together slowly but surely"
We can see KRK Rookit 8 in this picture. At 3:24 in this video, the ROKIT 8 label on Collier's studio monitors comes into focus. These monitors were used during the production of Collier's debut album, *In My Room*. A Pair of KRK's, newly shipped and packed is seen in the provided photo by ZXR Productions Official. This item can be seen in this Instagram picture, uploaded by the artist himself. Edit: This seems to be the Second Gen. Model, instead of the 3rd one. Subbmition fixed. Not the best monitors in the world, but they could be seen as the best for the money. Definitely want to upgrade soon, but for now they do the trick. Have never had an issue, and they may color the sound slightly, but only to the extremely trained ear. Great for beginners and intermediate producers. They do exactly what you need them to do at the price point, since monitors can be ridiculously expensive. Enough bass response to use without a subwoofer, but it helps. I bought them after using over years the RP 4. I use them with a pair of Behringer 1031 Acitve setup. Great sound and strong bass - luv it. They are really load but need some fine tuning. They are kinda heavy on the low end of things but they seriously kick. Used for DJing Parties and also my main Studio Monitors. They are Durable, Loud and very clean. I have enjoyed the clear sound of these speakers. They are very powerful. Love these new G3 Rokit 8s. They can be tuned to pick up lots of bass for your productions or even for recreational listening. These are great monitors for the price, and the 8" seems to be the one to get if you don't want to have to buy a sub. 2x KRK Rokit 8 G3. A proven classic used in studios worldwide as proven reference monitors. Powered 2-1ay , ported monitors with 8" kevlar reinforced woven woofers and fabric dome 1" tweeters. There is a reason these have sold millions of units and appear in studios the world over. They are near perfect reference representation of recorded sound. My current studio monitors and the best studio monitors ever. Very powerfull and clean sounding monitor.